We celebrated Daddy all weekend! 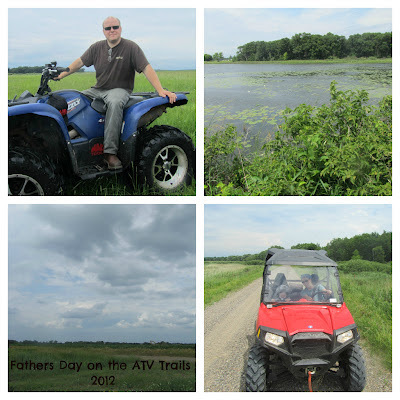 Saturday we spent most of the day on ATV trails, only stopping for a quick picnic lunch. Luckily we missed the rain, though we saw plenty of dark clouds. Mud, dust, and some beautiful, rural scenery. The celebration today was very food related. This morning we made him breakfast, took him out to eat after church and even bought a pie for dessert this afternoon. My son and I have been talking about Father's Day a lot lately. We made cards for Daddy and all the grandpas earlier this week. He liked the idea that Dad got to pick what we were going to do this weekend and every morning this week he would ask "is it Daddy's day yet?". He also tried to convince Dad to pick bowling as our family activity and which movie he should pick for movie night this weekend. (I lobbied for Star Trek in honor of Grandpa, since one of those movies were part of most Father's Day of my childhood but I was out voted). I'm so thankful for my husband's influence on our son's life, especially since our three year old always wants to be where Dad is, wanting to be Daddy's helper and buddy. I'm also thankful for my Dad, Father-in-law and grandfathers. It is amazing to reflect on their influence on our lives and seeing their impact on the next generation.